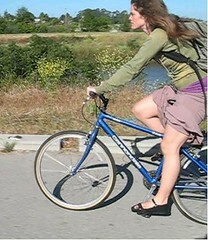 A cyclist on the San Lorenzo River Trail in Santa Cruz, California. Photo by me. Here’s a discussion thread for the weekend: CycleDog wants 100 ideas to improve cycling in his state. What are some good things you’ve seen that improved or promoted cycling in your area? What are some interesting ideas you’ve seen? Here are a couple of things off of the top of my head. Signage: “Cyclists allowed use of full lane”. For examples around the United States see this page. I see these all over the place in San Francisco, and cyclists do indeed use the full lane in many locations. I believe these are much clearer than the ambiguous “Share The Road” signs. Motorists complain that when cyclists take the lane, the cyclist is not “sharing” the road. full bike lanes. The San Francisco Bike Program is to be thanked for over two years of studies and lobbying the state to adopt a sharrow standard. What are some things you’ve seen in your community that improve conditions for cycling or encourage people to ride a bike? * Public Service Announcements on TV (preferably by Mayor, Chief of Police) to let people know that bikes belong on the road and not on the sidewalk. * Police need to start handing out tickets to people who ride bikes on the sidewalk. This summer, Columbus started providing bike corrals for parking at our series of downtown festivals. This calls attention to the idea that bikes can be ridden downtown instead of driving cars. It also keeps the bikes out of the way of harm and/or theft, and also keeps them centrally located and not chained to everything in sight due to a dearth of bike racks. In some states it is not against the law to ride on the sidewalk, and due to the lack of information goven to motorists it is sometimes the only sane place to ride. Texas is one such state, and there are some roads in Collin county that, unfortunately, you would be insane to ride on without hopping on the sidewalk. Thanks for the plug, Fritz! Actually, I got it from http://100ideasok.blogspot.com/ where the state is soliciting idea to improve Oklahoma. There’s a name for these idea-spawning exercises but it escapes me just now. Regardless, there are no bad ideas or stupid ideas when you’re doing something like this, because even an idiotic one can provide the spark for someone’s better idea. And if you’ve read CycleDog, you’ll know that I’m hardly afraid of idiotic ideas! Zoning and building construction permits for businesses should require the installation of approved devices to which bikes can be locked. The number of new buildings (and, of course old ones) with no facilities to lock bikes is amazing. Some bike shops don’t even have them. What about promoting a car-free day or a ciclovia once a month for a few hours. I recently spent $100 of my own money to hand out LBS gift cards to all of the bike commuters at my company. LBS kicked in $40. I spent my own money because of my company’s lack of interest in a healthy work force. Don’t get me started. Maybe people will get tired of yelling when they have to pass a bike every block or two. Promote more bicycle use. Hope for even higher gas prices!